RadiaSoft scientists and engineers model a large variety of particle accelerator systems, including free-electron lasers, storage ring light sources, X-ray beamlines, electron linear accelerators, high-intensity proton synchrotrons, and accumulator rings. Directed energy systems can be found in compact X-ray sources, high-power radar, electromag­netic pulse sources, and THz radiation. We perform cutting-edge research and actively collaborate with experts at laboratories and universities to develop innovative solutions within challenging problem domains. Our PhD-level experts can be made available as consultants as you expand into new areas, or you can outsource components of your project entirely to our research team. 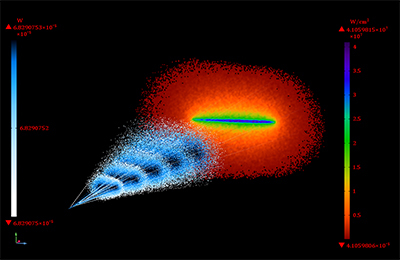 Particle bunch propagation through a radiofrequency cavity. Synchrotron radiation ray tracing and incident heat load. We develop solutions for complex problem domains via the COMSOL® software and C/C++, Java®, Python, and Fortran codes. In addition, we create intuitive graphical user interfaces (GUIs), accessible via web browsers, for various specialized codes and models. For examples of past and ongoing simulation projects at RadiaSoft, please visit beta.sirepo.com. Our active collaborations are listed at www.radiasoft.net. RadiaSoft scientists frequently present their work at conferences and publish in refereed journals, such as in this keynote talk on using modeling and simulation applications to improve synchrotron light sources.